Real bread, low carb vegan style! I'm so happy I invented this bread! 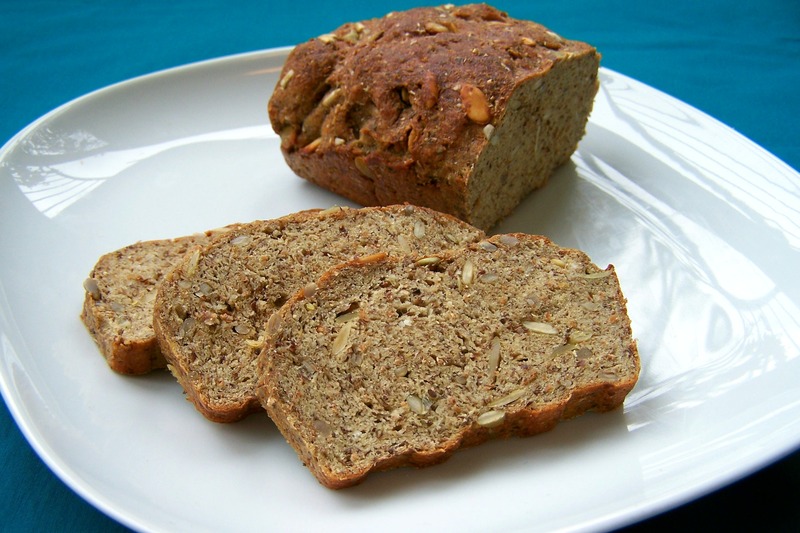 The recipe makes a great high protein low carb bread with a nice authentic flavor. It's not at all gummy like some gluten based low carb breads are. It's pretty dense and stick-to-your-ribs, almost like Ezekiel, but still has a lovely soft crumb. It's great for open faced sandwiches and toast. You can combine it with savory spreads or vegan cheese or sweet toppings like low carb fruit. It also goes very well along with a bowl of soup or stew. It freezes great so I like to make a double or triple batch and have some around for a quick meal or snack. Put all the dry ingredients into a large bowl. Whisk them together and eliminate any lumps of flour. Add the water and olive oil and use a fork to mix everything into a soft, but not sticky ball of dough. Use your hands to knead the dough for a minute or two and then form it into a large roll. Grease a small loaf pan with some extra oil and push the roll of dough into it. Turn the roll over and push it in again, so it gets covered in a thin film of oil on both sides. Cover the loaf pan with a towel or cutting board and let the bread rise in a warm place for 90 minutes until it has doubled in size. Preheat the oven to 180 C or 350 F and bake the bread for 35 minutes until is is nicely brown and sounds hollow when you tap on it. Let the bread cool down slightly and then turn it out of the pan. Wait for it to cool completely before cutting it into slices. It will keep for a few days at room temperature and multiple months in the freezer. One slice of bread (of 18 slices) contains about 81 kcal, 3,5 g fat (0,4 g saturated), 2,4 g net carbs, 2 g fiber and 8,5 g protein. Hello, My wife and I live in the USA (Michigan) and have recently started a low glycemic diet to reduce seizures our daughter has had. We're are vegan and we were unsure we could be successful at the diet but your recipes have been a tremendous help. We love your bread and waffles and I look forward to making many more of the recipes. Thank you so much for sharing! P.S. Is an etelpel a tablespoon? Also, often you have a 1/2 tablespoon listen in your ingredients. Is this correct or a mistake? It's not a common measurement to my knowledge. Hi Scott, I'm so happy to hear that my recipes are helpful for you. Looks like I was a little sloppy translating that bread recipe. An 'eetlepel' is indeed a tablespoon. I fixed that now, thanks for letting me know. 1/2 tablespoon is quite common here in the Netherlands, but maybe not so much in other places. You could also do 1 1/2 teaspoon, that's about the same amount. Best wishes of good health to your daughter! Thanks a lot for this recipe, it came out perfect. I switched half the soy meal for hemp protein, which makes the end result look a little darker, and I switched almond meal for ground hazelnuts (because that's what I had at home), and the wheat bran for physillium husks, but only one tablespoon. Call me a mad scientist for doing all that, but it worked :) The bread is nicely fluffy even though it's dense, and the taste is great, and it doesn't have the annoying too-moist-and-sticky-ness that store-bought protein breads often have (at least here in Germany they do). Will definitely do this again!!! Thanks for the feedback Claudia! I'm glad you liked it and the substitutions worked for you. I just made the dough and it is rising right now. Can't wait to try it! By small loaf pan, I assume you mean 7'x4"? I'm curious whether anyone has tried doubling the recipe and baking it in a 9'x5' loaf pan. Hi Denise, 7x4 inches sounds about right. Standard Dutch loaf pans are slightly longer and more narrow, but I think it will be fine. Doubling and using a larger pan will probably also work, but you may need to bake it slightly longer. Hi Ettienne, why do you think 81 kcal is impossibly high? The daily recommended intake for an adult woman is 2000 kcal, so 81 kcal is less than 5% of that. People often get confused about calories and kilocalories, but kcal is the official measure commonly used for calories. Woooow, I'm really glad to find your site and can't wait to try your recipes :) Just one quastion - do you know if it is possible to replace almond flour with coconut flour? Hi Ann, glad you found us too! Coconut flour absorbs a lot more liquid than almond flour, so you cannot replace them 1:1. You would either have to use much less flour or add more more water. It would take some experimentation to get the ratio right. How do you think this recipe would go in a bread maker? I tried it! Using the bread maker worked out great! This recipe was fantastic. That's wonderful Kate! Thanks for letting us know. Hi Jani, total carbs is net carbs + fiber. Hello Martine. I am about to try this recipe. Just curious to know does the instant yeast require a sugar for activation? Hi Lakshmi, you can make the recipe exactly as written. The yeast does not need added sugar. It feeds on the small amount of carbs in the flour and that is enough to let the dough rise.